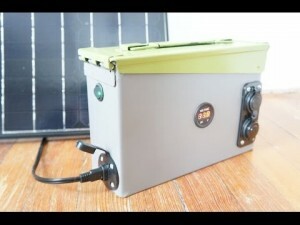 This 2 part series shows you how to build 240,420W Solar Power Generators .The first video outlines detailed step-by-step instructions on how to build a portable solar powered generator.The second video explains how to connect your generator to a solar panel and charge controller for charging, Also covered is how to combine your solar panel and charge controller into one unit so as to be more portable.This is powerful enough to recharge a cell phone, run a radio and power your fans and flashlights multiple times over. You can even charge power tools several times using this. As you can see, this is something that will provide substantial power thanks to the energy of the sun. The materials you need for this project are Solar Panel – We used a 10 W solar panel, which provided us with enough power to keep the battery charged.Wiring – Use extra-long wiring to attach your solar panel to the case to give yourself more flexibility on where you can point the panel towards the sun.Ammo Box – We used a large ammo box as a case. You aren’t limited to an ammo box. You can get creative and use anything that would hold your battery.Battery – We used and 18 amp hour battery to give us plenty of recharge and capabilities for all of our needs.Charge Controller – This is the middleman between the solar panel and the battery. It ensures that the battery does not get overcharged when it is full.Velcro – To hold the panel on while keeping it detachable.Inverter and USB Ports – Allows us to plug our electronics in and charge them.